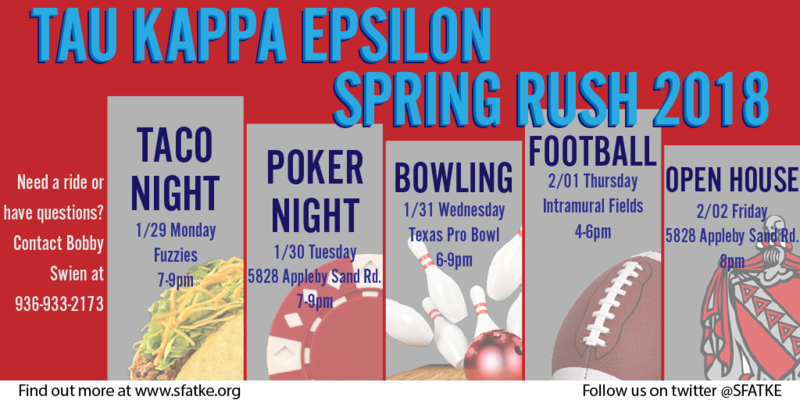 Are you interested in joining a fraternity this semester? Well be sure to come out to at least one of our events and get to meet some the guys! TKE might just be the fraternity for you. We do philanthropy work, volunteer work, get involved on campus, and help each other out when we need it. We're constantly busy working to improve ourselves and what we believe in and are always looking for people to do the same. We can help network you to members across the globe and in turn provide scholarships, job opportunities and even friends. There's so many benefits to joining an fraternity like TKE that it's hard to pass up. Please feel free to contact our recruitment chair for more information.